SIA Retrench Pilots In 2016 Due To Oversupply But Now Invites Indian Vistara Pilots To Fly For SIA To Meet “Manpower Needs”? – Sinking It In! 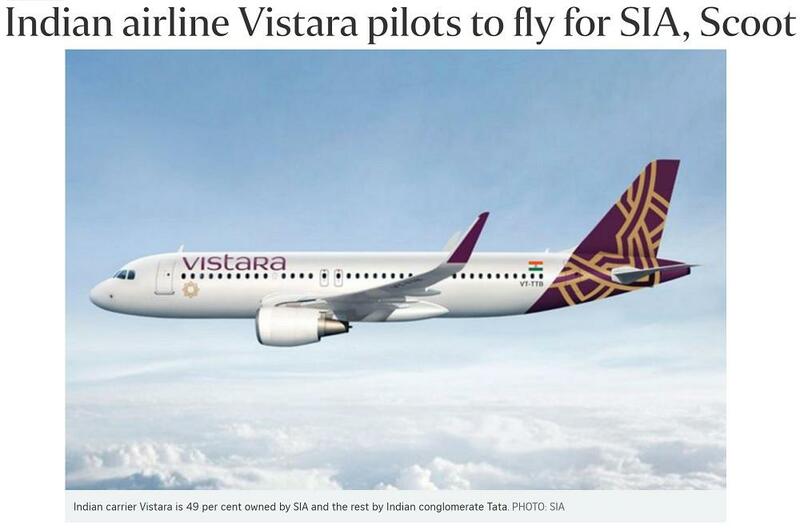 In an utterly puzzling move by Singapore Airlines, it was announced that SIA would bring over 24 Indian pilots from Vistara Airlines to help meet its manpower needs and to provide Vistara pilots experience flying long haul flights. This move by SIA to invite foreign pilots to make up for the supposed manpower shortfall is puzzling because just 2 years ago, SIA announced that it would be shedding (retrenching or voluntary retirement) 12% of its pilot pool due to the business slowdown and it claimed in 2016 that it still had more than enough pilots than it needed. SIA had also over the years frozen pilot cadet recruitment and consistently downsized the pool of pilots it had at its disposable due to stunted growth in the long haul premium sectors. Seeing that the overall airline business environment has not improved, it is surprising that Singapore Airlines has the resources and capacity to accomodate Indian pilots from its subsidiary Vistara when its existing pool of SIA pilots are being told year on year that their services were no longer required due to shrinking business results. As a national airline that Singaporeans are proud of, surely there must be certain protections for its pool of pilots, especially our locally trained pilots who fly the Singapore flag overseas to ensure a smooth and safe flight for its customers. After years of downsizing its pilot pool, only to abruptly announce the hiring of Indian pilots to make up for a manpower shortfall, this is a bitter pill to swallow for existing SIA pilots. Is SIA giving enough consideration to locally trained professionals first before turning their sights to foreign talents with a similar set of skills. As a national airline, SIA should be more conscious of its business decisions as it sets an uncomfortable precedent for others. Hopefully, SIA is not making the mistake of sacrificing local expertise for cheaper and more convenient foreign human resource.